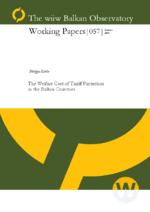 For eight Balkan countries (Albania, Bosnia & Herzegovina, Bulgaria, Croatia, Macedonia, Romania, Serbia & Montenegro, and Slovenia) the welfare cost of tariff protection on imports of goods based on recent years tariff data (2001 to 2003) is computed. The computation is based on a partial equilibrium framework with constant elasticity demands and perfect substitutes with a compilation of 6000 tariff lines. The focus on the import market allows to identify tariff peaks but the welfare loss of protection is concentrated in a small set of products, namely food products, tobacco, textiles and agriculture. With a simulated extrapolation to imports of services and when the administrative cost of tax collection is taken into account, the welfare cost is equal, on average, to 0.7% of GDP, that is $ 0.9 billion ($ 18 per capita). In Romania, the highest protection deals with intermediate goods and capital goods -as in import substitution policies used in the past by developing countries- strengthening the perverse effect of trade policy on economic growth.